I was recently given the opportunity to try the Nu-NAAT Chocolat Special collection. This includes the Creamy Chocolat Shampoo, Creamy Chocolate Conditioner, Chocolat Special Chocolate Cream Hair Mask and the Chocolat Thermo Active Anti-Frizz. I have to tell you up front I first chose the Chocolat Special Collection just because it sounded good! Let me tell you though, this was a really good match for my hair. I have pretty normal hair. I don't color my hair or use blow dryers or curling irons often. I did have a perm done about a year ago, but I really don't do much other than pull my bangs back between decided to let them grow out and then cutting them. Anyway, on to the Chocolat Special Collection. Have you ever heard the term "squeaky clean"? Years ago I had a friend who worked at a hair salon. She told me the best way to know that your hair was really clean and not coated with chemicals was when you could hear it squeak as you rinsed it when rubbing your hand over it. Guess what? 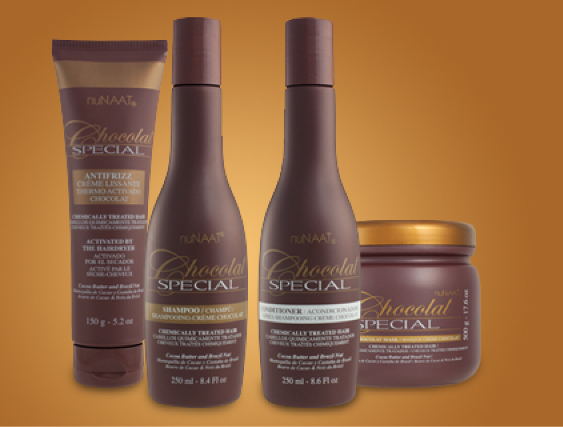 Nu-NAAT Chocolat Special Shampoo ($5.99) and Conditioner ($4.99) does just that! I can hear the squeak as I run my hands over my hair while rinsing it. I haven't had that feeling in quite some time. And yes, it smells GREAT! I wish you could see and feel the difference. The Chocolat Special Chocolate Hair Mask ($5.99) is designed to use twice a month, but, I used it more like once a week. It made my hair feel really soft. This also has that great fragrance. I only used the Chocolat Thermo Anti-Frizz ($6.99) maybe 2-3 times because as I said earlier I really do not use a blow dryer or curling iron often. This is the hair mask. My overall response is that I highly recommend this Nu-NAAT Collection. Do remember though that not everyone has the same type of hair. If you have a different type though, don't worry, Nu-NAAT has a collection that should work for your hair also. You can use their store locator, or you can purchase from Nu-NAAT online! Be sure to follow Nu-NAAT on their social media, like Facebook, HERE, Twitter, HERE and Youtube HERE.